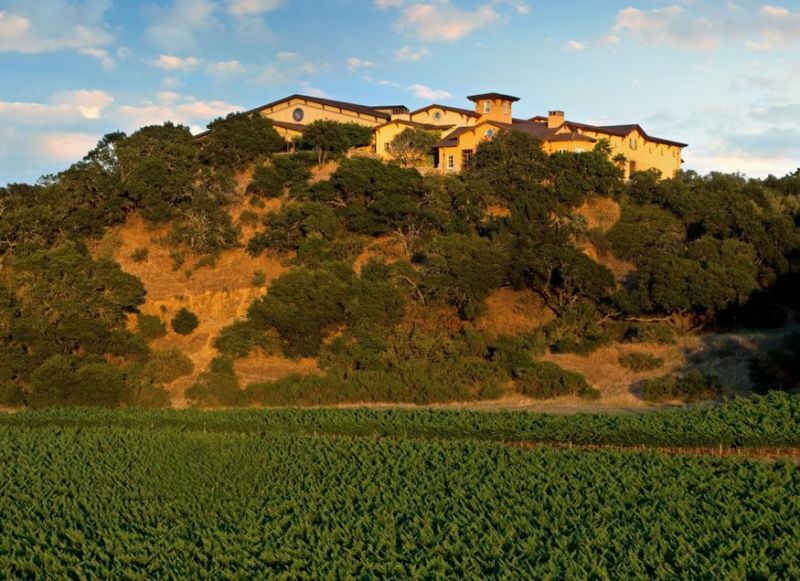 Silverado Vineyards sits atop a hill between Silverado Trail and Highway 29; its entrance from the former road. 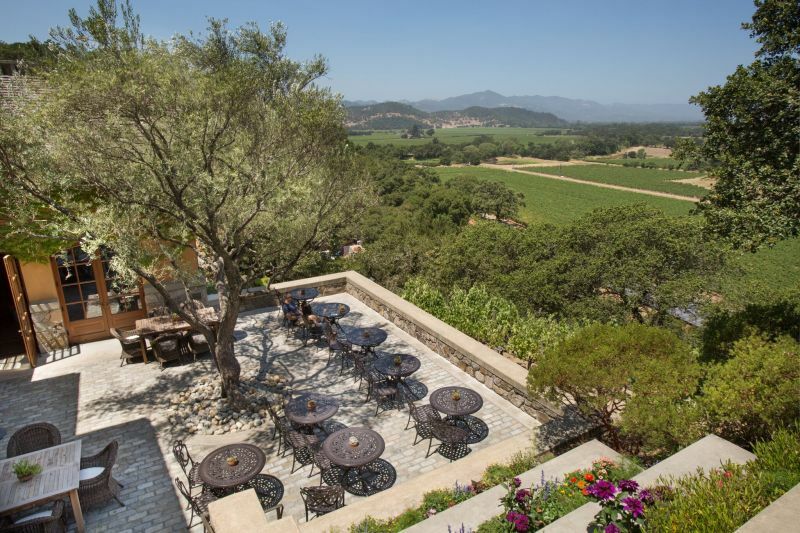 The tasting room has windows and a terrace that look up and across the valley. On the day of our visit, the view was marred by one of this winter’s rain storms. The foul weather did not, however, dampen our spirits or detract from the airy attractiveness of the interior. We had a private tasting with Jon Emmerich, the winemaker. Jon has been in that role at Silverado for over quarter of a century. 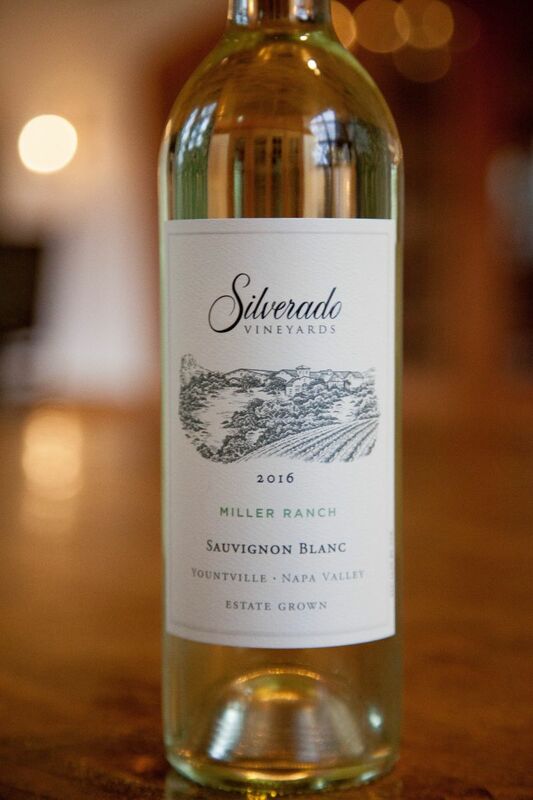 He is only the second person to fill the role of winemaker, in Silverado’s history. He explained that all of the wines are made from estate-grown fruit; they do not buy any grapes from elsewhere. California Girl comments: Like his wines, Jon is down to earth and easy to enjoy. You can tell he’s not a flashy salesman type of winemaker. He’s passionate about his craft, the land, and his wine. It was a real pleasure spending time with him and tasting through the wines with him. Our tasting started with a glass of the 2016 Sauvignon Blanc ($25) . The grapes come from the 90 acres of Miller Ranch in Yountville, almost due West of the winery. Jon described the vineyard as a Goldilocks estate, balanced between cool and warmth. This Sauvignon Blanc contains 5% Semillion grapes and is tank fermented. The resulting wine had a nose of grapefruit and peach; surprisingly lush for a Californian Sauvignon Blanc. Taking a long sip exposed a creamy and soft mouthfeel. I tasted toffee, honeysuckle, and apple. The finish was supported with a tingle of pepper. This is one of the best Sauvignon Blanc from Napa that I have tasted. 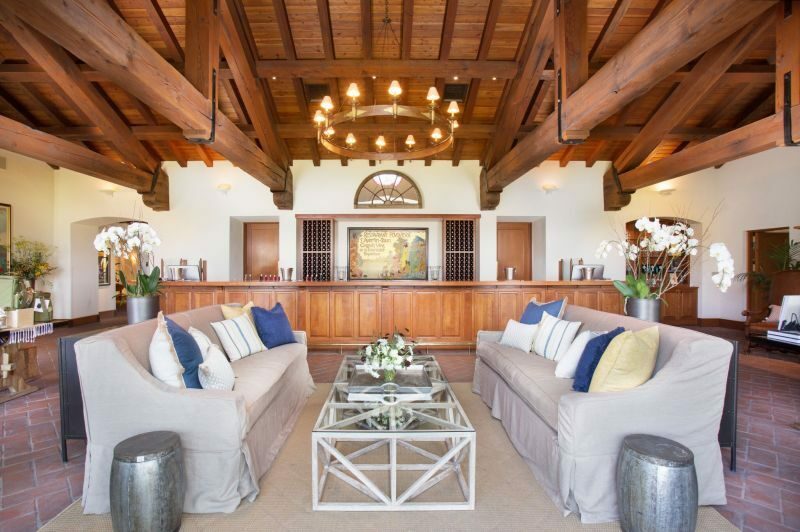 California Girl comments: We aren’t big Sauvignon Blanc fans but this one I could become one. I am always amazed when I get one with flavors other than just straight grapefruit and minerals. This one was bursting with the fruits in both the nose and the flavor of the wine. We sipped the Sauvignon Blanc as Jon took us through the barrel room; about which I shall write in a follow-up post, as it is an experience that deserves its own article. Returning from the barrel room we started on the formal part of the tasting with the 2015 Chardonnay ($35). The grapes are from both Sonoma and Napa sides of Carneros. Jon explained that the wine was a blend of four different Chardonnay clones, that 20% had been matured in barrels, and that 70% had undergone malolactic fermentation. I repeat this information, as a demonstration of the care and thought that goes into the creation of the wines we enjoyed at Silverado. The nose was of ripe apples and a hint of peach. Tasting it revealed flint, pear, honey, and rose petals. This wine was the antithesis of an over-oaked Chardonnay; delicate and complex, with every sip to be savoured. Earlier vintages of this wine had been bottled with a screw-cap, but consumers still associate those with cheap, low-quality wines and from 2015 they have switched to using corks and a heavier bottle. 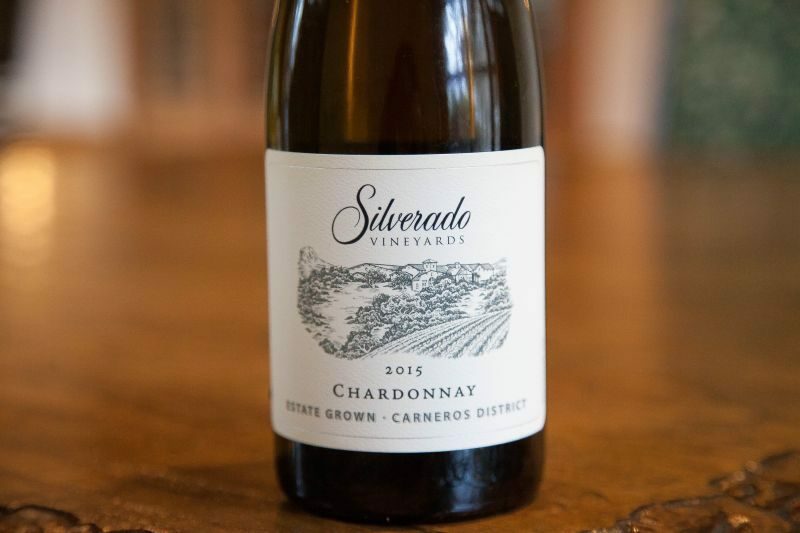 California Girl comments: I think this chardonnay has made it to my “favorites” list. I don’t know what Jon does to get the smell he does in the wine, but it’s a WOW. I was beyond impressed with this beauty. I need to purchase some of this for our cellar. It is a wonderful sip and I highly recommend you buy it for the white wine drinkers in your life. Our first red wine was the 2012 Merlot ($40) from the Mt. George Vineyard which is located in the Coombsville area of Napa. Silverado bought this vineyard in 1988 and grow all five of the main Bordeaux varieties there. This wine spends ten days in contact with the skins, with 95% Merlot and 5% Cabernet Sauvignon On a nose of overwhelming fruit, dominated by blackcurrant, I did get a waft of coffee. The flavour was complex with plum, black tea, and pepper that led into a long finish that was joyous. The wine is drinkable right now, although it should improve with age. We bought a bottle and will see if we have the willpower to verify its age worthiness. California Girl comments: Some people think Merlot is boring. That is because it became so over popular that winemakers were mass producing cheap versions. 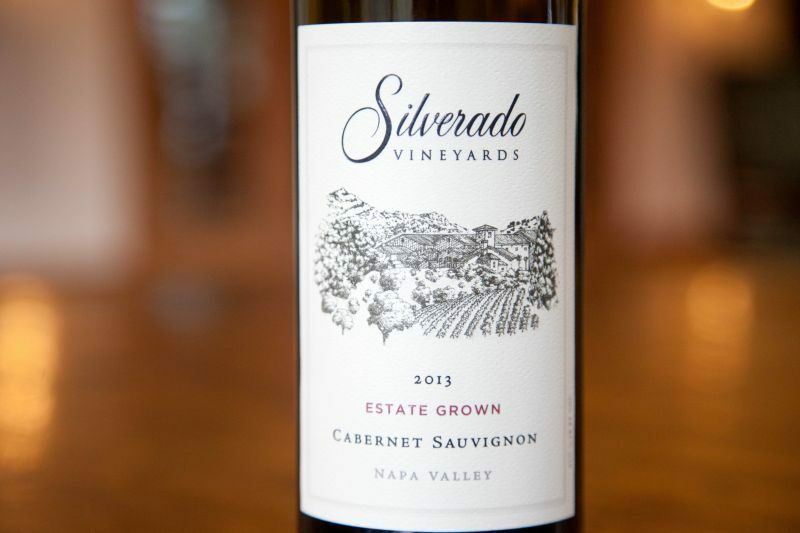 Silverado Vineyards produce a wonderful Merlot. The beauty of this wine is not only is it flexible and able to work with all kinds of food, but it is also drinkable on its own. This wine too goes on our highly recommended list. The thing I like about this wine is that at $40 a bottle, it is something that most people can afford for a special occasion or a good weekend wine. You wouldn’t hesitate to open this one over a romantic dinner or a nice meal. The next taste was from the 2013 Napa Valley Estate Cabernet Sauvignon ($50). The grapes were grown in Stags’ Leap and Coombsville. The first impact from the nose was of leather; fruit in the form of plum and raspberry followed. I also got a whiff of Christmas cake. Just as the nose started aggressively and opened up to a richer complexity, the tannins hit me on the first sip. Those tannins faded as the other layers of black cherry, and raspberry were revealed. In the finish that initial impression had faded to black tea. This again, whilst young for a Cab, could be enjoyed now, but definitely, should improve. California Girl comments: I was very impressed with just how approachable and drinkable this wine was despite its youth. I also thought it was well priced at $50. So many of the Napa Cabs are not at an affordable level. I love that this one gives you real value for money along with great taste. 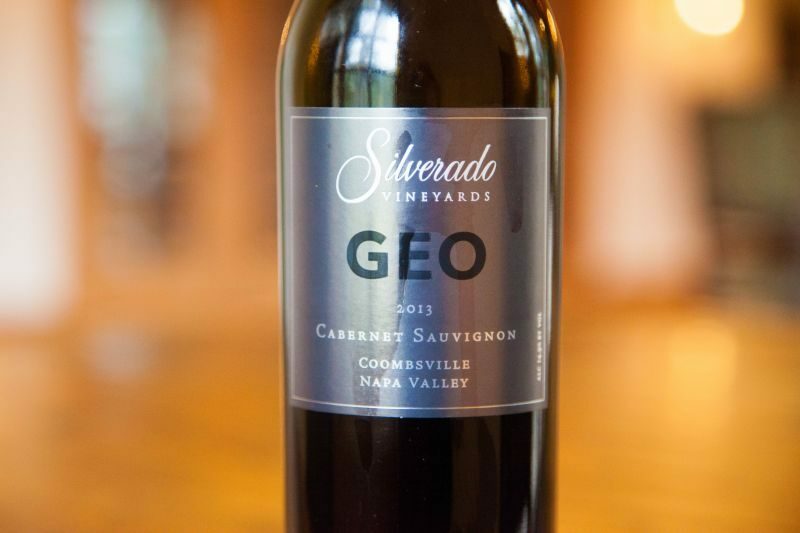 The penultimate wine was the 2013 Geo Cabernet Sauvignon ($75). 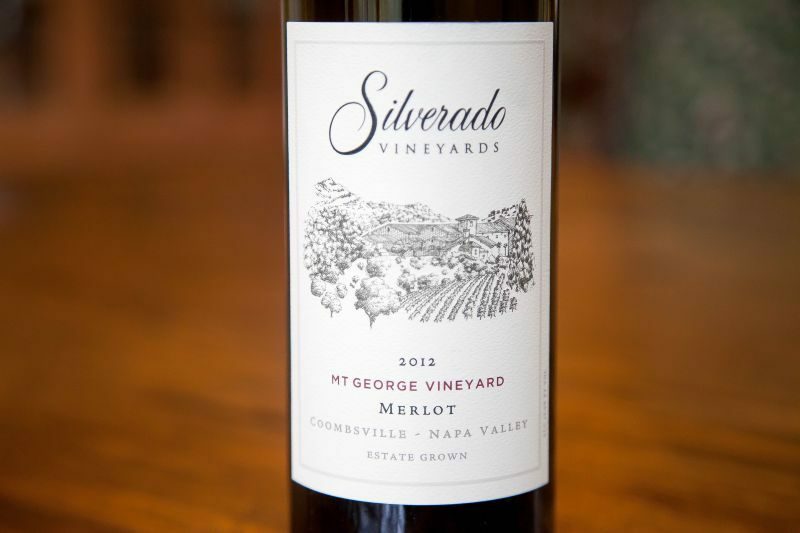 It gets its name from the Mount George vineyard, Silverado’s Coombsville property; it is also the Greek word for Earth, indicating the wine is an expression of the land in which the grapes grow. It is 12% Petit Verdot and spends seventeen months in a mix of French and American Oak. Production is 2,200 cases. The nose was a rich contrast of raspberry, dark chocolate, and leather. The initial taste belied the wine’s youth with a luxuriant softness, that extended into a long finish of plum and raspberry. The tannins that joined the fruit in the finish suggest that this wine needs age to reach its potential, but it is drinkable now. California Girl comments: I too was very impressed with this wine. I could imagine this beauty served with a gorgeous lamb dish. Something meaty and decadent. It isn’t a wine that NEEDS food. It will pair with food or it can be savored on its own. 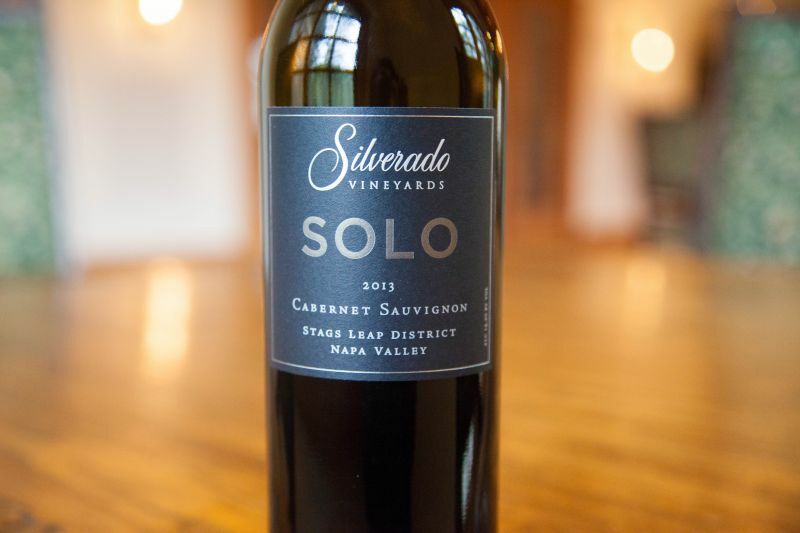 The last wine was Silverado’s flagship wine; Solo ($125) . Just 1,400 cases of this 2013, 100% Cabernet Sauvignon wine from their Stag’s Leap property were made. The nose was intense and balancing fruit notes of raspberry and cherry with dark chocolate. The mouthfeel was soft, with the tannins emerging and dominating the plum and strawberry. This wine felt too young to drink now; the promise of potential too much to justify early consumption. I preferred the Geo on the day, but imagine that were I to revisit in five years or so, my position would be reversed. California Girl comments: I agree this wine was drinking a little young, but it is all there just waiting to mature and soften. It is going to be a knockout wine. The nice thing about Silverado Vineyards is that they offer library wines for sale. No cellar to age your bottle? Here you can buy one preaged at not a huge markup. SCORE! From the Sauvignon Blanc to the Solo, I was impressed with these wines. I would love to visit again on a sunny day where I could sit on the terrace and experience both the view and a regular tasting. California Girl comments: I agree! This is a beautiful place to enjoy amazing wines. I can’t wait to go back for more.